Because of its simplicity, blinking is a prominent model system in analysis of adaptation and conditioning with the cerebellum. Nevertheless, data on the role of the cerebellum in modulation of normal reflex blinks are limited. We correlated the discharge of interpositus (IP) neurons with normal trigeminal reflex blinks and blink adaptation in urethane-anesthetized rats. Two groups of IP neurons responded to cornea stimulation. One group, pause neurons, showed a long cessation of their tonic discharge beginning 6 ms before the end of lid closure. The second group, burst neurons, exhibited a transient increase in firing frequency at a constant interval after the cornea stimulus. The cessation of pause neuron activity appeared to contribute to the termination of blinks. The tonic discharge rate increased and the cessation of pause neuron activity was delayed coincident with increased amplitude and duration of reflex blinks produced by blink adaptation. There was a coincident increase in the amplitude and duration of reflex blinks with increased tonic activity and delayed pause in pause neurons treated with the GABAA antagonist, gabazine. Burst neurons did not appear to modulate reflex blinks. Burst neuron discharge correlated neither with blink characteristics normally nor with blink adaptation. These findings indicated that pause neurons affect reflex blinks by providing a tonic excitatory input to facial motoneurons during lid closure and then disfacilitating those motoneurons to adjust the termination of lid closure. Burst neurons may play a role in eyelid conditioning. A blink involves only three muscles and a passive force and is unencumbered by constraints of movement direction, joint interactions, or gravity (Evinger et al., 1991; Sibony et al., 1991; Sibony and Evinger, 1998). This simplicity explains the prominent role of blinking in studies of motor adaptation and eyelid conditioning involving the cerebellum (Raymond et al., 1996; Pellegrini and Evinger, 1997; Hesslow and Yeo, 1998; Mauk et al., 2000; Attwell et al., 2002; Yeo, 2004; Thompson, 2005). Data from eyelid conditioning studies dominate our understanding of the role of the cerebellum in normal reflex blinking. To elucidate the role of the cerebellum in this motor learning, however, it is essential to understand how the cerebellum modulates normal reflex blinking independent of its role in eyelid conditioning. Interpretations of the role of the cerebellum in modulating reflex blinks from eyelid conditioning studies do not always agree. Although some studies report that the cerebellum is essential for eyelid conditioning but plays no role in unconditioned reflex blinks (Steinmetz et al., 1992), the majority of studies support the concept that the cerebellum modulates both conditioned and reflex blinks. For example, cerebellar cortex damage increases the amplitude of unconditioned blinks (Yeo and Hardiman, 1992; Gerwig et al., 2004), whereas a cerebellar nucleus lesion or inactivation decreases their amplitude (Welsh and Harvey, 1989; Welsh, 1992; Bracha et al., 1994; Wikgren and Korhonen, 2001; Jimenez-Diaz et al., 2002, 2004). Recordings of deep cerebellar nucleus neurons during the conditioned eyelid paradigm suggest that interpositus (IP) neurons facilitate eyelid closure of conditioned and reflex blinks. A series of careful studies of eyelid conditioning in alert cats reveals two types of blink-related IP neurons, one that increases its firing frequency with the beginning of a reflex blink and a second type that decreases its firing frequency with reflex blinks (Gruart et al., 1997; Jimenez-Diaz et al., 2002, 2004; Delgado-Garcia and Gruart, 2005). These investigators interpret the first type to facilitate the lid closing orbicularis oculi (OO) muscle and the latter to promote activation of the lid opening levator palpebrae muscle with reflex blinks. In the rabbit, most anterior IP neurons exhibit elevated activity followed by a pause in activity starting ∼50 ms after an air puff unconditioned stimulus (Aksenov et al., 2004, 2005). In recordings from the anterior IP of rats, an intense periorbital shock generates a burst of activity (Freeman and Nicholson, 2000). The focus of these studies on conditioned blinks may obscure IP mechanisms associated with other forms of motor learning such as adaptive blink modification (Evinger et al., 1989). In a study of the discharge of Purkinje cells during compensatory blink adaptation, the data suggest that IP neuron discharge contributes to terminating OO muscle activity (Pellegrini and Evinger, 1997). Although IP neurons modulate blinking through a common pathway, it is possible that distinct subdivisions of the IP participate in different forms of blink system motor learning. Experiments were performed on 150–400 g male Sprague Dawley rats maintained on a 12 h light/dark cycle and fed ad libitum. All experiments adhered to federal, state, and university guidelines concerning the use of animals in research. Animals were anesthetized with xylazine (10 mg/kg, i.m.) and urethane (1.2 g/kg in saline, i.p.) and placed in a stereotaxic apparatus. The skull above cerebellum was removed to allow introduction of microelectrodes. A pair of Teflon-coated, stainless-steel wires bared 1 mm at the tip, were implanted into the medial and lateral margins of upper eyelid to record the orbicularis oculi electromyographic activity (OOemg). In some rats, a 3-0 silk suture was sewn to the central point of the lower margin of the upper eyelid to allow lid restraint. Reflex blinks were evoked by electrical stimulation of the cornea through a pair of silver ball electrodes placed on the cornea or an air puff directed at the cornea. Electrical stimulus intensity was adjusted to produce a partial closing of eyelid without moving the electrodes. Over all animals, the current intensity ranged from 0.1 to 3.0 mA using stimulus durations from 0.1 to 0.3 ms. For the experiments with different stimulus intensities, threshold (T) was defined as the minimum intensity reliably evoking OOemg activity. Either single or double cornea stimuli with a 300 ms interstimulus interval were presented on each trial. A single air puff stimulus was delivered through a pipette directed at the cornea, which was 3 mm distant. Stimulus intensity was 20 psi at the source and its duration ranged from 10 to 20 ms. The timing of the arrival of the air puff stimulus at the cornea was determined by recording the response to the air puff stimulus from a microphone placed 3 mm from the pipette. To avoid habituation, the interval between trials was 40 s regardless of stimulus parameters. For each neuron in the study, we collected data from at least 40 trials. To induce adaptive increases in blink amplitude, the upper eyelid was restrained by connecting the suture attached to the upper eyelid to a fixed bar. The rat received 20 trials before restraint, 40 trials with the eyelid restrained, followed by 40 trials without restraint. Electrical stimulus intensity and placement of the electrodes on the cornea were held constant before, during, and after lid restraint. Tears were wicked off of the cornea every 20 trials. Single units were recorded extracellularly with a glass micropipette [1.5 mm outer diameter (o.d. ), 1.16 mm inner diameter (i.d. ); AM Systems, Carlsborg, WA] filled with 2 m NaCl saturated with Fast Green. Electrode tips were broken to produce impedances between 5 and 20 MΩ. To apply gabazine (SR-95531; Sigma, St. Louis, MO), a GABAA antagonist, a double-barrel glass electrode (1.2 mm o.d., 0.6 mm i.d. ; AM Systems) was used. The recording barrel was filled with 2 m NaCl saturated with Fast Green, and the other with 100 μm gabazine in saline. Microinjections were made with a Picospritzer (General Valve, Fairfield, NJ) attached to the gabazine barrel. To estimate the volume injected, gabazine was injected into oil on a microscope slide well using the same microelectrode and injection parameters used in the experiment. Based on the size of the bubble, microinjection volume ranged from 1.5 to 17 nl over all of the experiments. The recording and microinjection sites were marked by Fast Green (Thomas and Wilson, 1965). At the end of experiments, animals were deeply anesthetized and perfused intracardially with 6% warm dextran in 0.1 m phosphate buffer (PB), pH 7.4, followed by 10% formalin in 0.1 m PB. The brains were removed and immersed in 30% sucrose in 0.1 m PB. To localize the Fast Green deposits, 100 μm sections were cut on a freezing microtome, mounted on subbed slides, and counterstained with cresyl violet. OOemg activity was amplified (Differential AC Amplifier, model 1700; AM Systems) and filtered at 0.3–5 kHz. Single unit recording was amplified (Microelectrode AC Amplifier, model 1800; AM Systems) and filtered from 0.3 to 20 kHz. For all experiments, OOemg and single neuron activity were each digitized and collected at 10 kHz (DT2821; Data Translation, Marlboro, MA), stored on a personal computer, and analyzed off-line with laboratory-developed software. Down-phase blink amplitude was calculated by integrating the rectified OOemg activity between the beginning and end of blink. Down-phase duration was the time between the beginning and end of the OOemg activity. Spikes were identified with a software window discriminator that compared each spike to a template. For each trial, the tonic firing rate was calculated over the 150 ms before the blink-evoking stimulus. Except where noted, all data are presented as the mean ± SD. To enable statistical comparisons using neuronal and EMG activity recorded in different experiments, data were normalized to the median of the control data for each recording. To test for significance, an ANOVA and post hoc testing with the Tukey's honestly significant difference and Bonferroni's tests were performed. An ANCOVA enabled comparison of the slopes of different linear regressions (see Fig. 2). We recorded 131 IP neurons for which a blink-evoking cornea stimulus altered their tonic firing pattern. From anterior IP to the posterior IP including the dorsolateral hump, these blink-related neurons were found laterally (Fig. 1, ▩, ●). Based on their discharge properties, we classified 91 of these 131 neurons as pause neurons (Fig. 2A,B) and the remaining 40 as burst neurons (Fig. 3A,B). Pause neurons were mainly found at the dorsal lateral hump and the border between the anterior and posterior IP (Fig. 1, ▩). Burst neurons were primarily found rostrally in anterior IP (Fig. 1, ●). Recordings made >200 μm laterally and medially from the blink-related IP region failed to find blink-related neurons (Fig. 1, ▵). Dentate neurons recorded at the border of blink-related IP region initially appeared to discharge with reflex blinks. Nevertheless, because the correlation between neuronal discharge and reflex blinks was inconsistent from trial to trial, these neurons were not studied further. Location of recorded neurons illustrated on drawings of rat deep cerebellar nuclei (Ruigrok and Voogd, 2000). There are 160 μm between sections. The numbers on the right refer to distance from bregma. AIP, Anterior interposed nucleus; DN, dentate nucleus; DLH, dorsolateral hump; DLP, dorsolateral protuberance; FN, fastigial nucleus; LVN, lateral vestibular nucleus; PIP, posterior interposed nucleus; SVN, superior vestibular nucleus. ▩, Pause neuron; ●, burst neuron; ▵, unrelated neuron. Pause neurons. A, Single trial of unit (top) and concomitant rectified OOemg activity (bottom) evoked by a cornea stimulus (▴). The up arrow indicates the end of the OOemg activity, and the down arrow shows the start of the cessation in unit activity. B, Spike density function (dashed line) and averaged rectified OOemg (solid line) of 15 trials evoked by a cornea stimulus (▴) of the pause neuron in A. C, Average of the spike density function (dashed line) and the OOemg activity (solid line) of six pause neurons with a burst in response to cornea stimulation (▴). D, Average of the spike density function (dashed line) and the OOemg activity (solid line) of six pause neurons without a burst in response to cornea stimulation (▴). E, Frequency distribution of the difference between the end of blink and the beginning of the cessation of pause neuron activity for 632 blinks from 27 pause neurons with a burst (○) and 20 pause neurons without a burst (●). Positive numbers indicate that the pause begins before the blink ends (Pause First). F, The end of OOemg activity as a function of the beginning of pause relative to cornea stimulation for 27 pause neurons with a burst (○) and 20 pause neurons without a burst (●). Each point is an average of 11–36 trials binned into 2 ms start of pause latency bins. Burst neurons. A, Single trial of unit (top) and concomitant rectified OOemg activity (bottom) evoked by a cornea stimulus (▴).The up arrow indicates the end of the OOemg activity, and the down arrow shows the start of the burst in unit activity. B, Average of the spike density function and the OOemg activity of three burst neurons in response to cornea stimulation (▴). C, Spike density function and averaged rectified OOemg of 15 trials evoked by a cornea stimulus (▴) of the burst neuron in A. D, Average of the spike density function (dotted line) and the OOemg activity (solid line) of the three burst neurons illustrated in C in response to an air puff stimulus (▴). The inset shows superposition of the cornea (solid) and air puff (dashed) spike density functions. OOemg scale for C and D are identical. E, The end of OOemg activity as a function of burst latency relative to cornea stimulation for averaged data (●) and individual blinks used to calculate the average (○). Each filled circle is an average of 10–37 trials binned into 2 ms burst latency bins. F, The mean (±SEM) relative peak firing frequency of the burst (▨) and OOemg amplitude (■) of six burst neurons in response to different intensities of electrical cornea stimulation. A blink-evoking stimulus interrupted the tonic firing frequency (51.2 ± 13.1 spikes/s; n = 91) of pause neurons with a long cessation of activity (Fig. 2A, ↓ Start of Pause) that began coincident with the end of OOemg activity (Fig. 2A, ↑ End of Blink) and lasted an average of 86.8 ± 43.9 ms for all neurons (n = 91) (Fig. 2A,B). Assuming that pause neurons facilitated OO motoneurons via the red nucleus (Fanardjian and Manvelyan, 1984), a cessation of pause discharge slightly preceding the end of OOemg activity would promote the termination of lid closing by disfacilitating OO motoneurons. For the neuron illustrated in Figure 2, A and B, the cessation of discharge coincided with the end of OOemg activity for electrically evoked cornea blinks. For this pause neuron and 47 of the other 91 neurons, a transient increase in firing frequency occurred during the peak of the OOemg activity (Fig. 2B, ↓). Pause neurons that exhibited a transient burst of activity were found more rostrally in IP (Fig. 1, −10.92 and −11.08) than pause neurons without a burst. 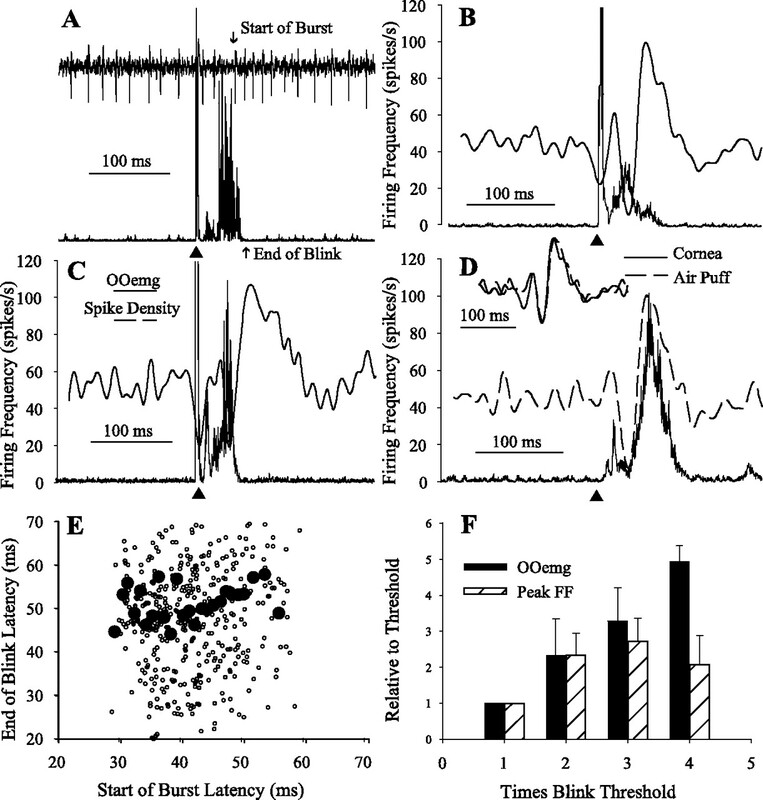 To estimate the discharge pattern of a population of pause neurons relative to the OOemg activity, we averaged the spike density function and OOemg activity of six pause neurons evoked by electrical stimulation of the cornea for six pause neurons with a transient increase in firing frequency (Fig. 2C) and for six neurons without a transient burst preceding the cessation of activity (Fig. 2D). The six neurons were chosen for averaging based on cornea stimulation evoking similar duration blinks rather than neuronal characteristics. For both populations, the decrease in the spike density function matched the fall in OOemg activity. To determine whether the cessation of pause neuron activity preceded the end of OOemg activity, we subtracted the time of the last spike before the pause in activity (Fig. 2A, ↓ Start of Pause) from the time when OOemg activity ceased (Fig. 2A, ↑ End of Blink). If the last spike of the pause neuron occurred before the end of OOemg activity, then this difference was positive (Fig. 2E, Pause First). Combining the data from 27 pause neurons with a transient burst (Fig. 2B) for which cornea simulation elicited robust blinks (379 blinks), the last spike before the pause occurred an average of 3.0 ± 19.9 ms before the end of OOemg activity (Fig. 2E, burst ○). For 20 pause neurons without a transient burst (Fig. 2D), the last spike before the cessation of activity occurred an average of 15.5 ± 23.8 ms before the end of the blink (Fig. 2E, no burst ●) (n = 249 blinks). The same data provided a basis for ascertaining whether the last spike before the pause and the end of the OOemg activity increased concomitantly. We averaged the latency of the end of OOemg activity relative to the cornea stimulus as a function of the last spike before the pause relative to the cornea stimulus using 2 ms bins for pause neurons with a burst (Fig. 2F, ○) (n = 5–26 blinks/bin) and without a burst (Fig. 2F, ●) (n = 5–15 blinks/bin). The slopes of the regression lines for pause neurons with a transient burst and those without a burst were not significantly different (F(1,67) = 0.43; p > 0.05; ANCOVA). Thus, both groups of pause neurons behaved similarly, supporting the hypothesis that the cessation of pause neuron activity contributed to terminating reflex blinks. Forty blink-related IP neurons were classified as burst neurons (Fig. 3A,C) because a transient burst of spike activity began an average of 16.5 ± 17.0 ms before the end of cornea-evoked blinks and lasted an average of 35.5 ± 13.7 ms. For all burst neurons, the average peak firing frequency of the burst was 121.24 ± 34.7 spikes/s. A brief pause in tonic activity preceding the burst began at 17.3 ± 5.5 ms after cornea stimuli and lasted 25.3 ± 5.9 ms. The average tonic firing frequency of burst neurons was 64.7 ± 16.95 spikes/s (n = 40). The discharge of burst neurons would contribute to the blink up phase if these IP neurons indirectly facilitated levator palpebrae motoneurons, which raise the eyelid, or excited an interneuron that inhibited OO motoneurons. Burst neuron activity, however, did not correlate with the end of OOemg activity. Despite large differences in the duration of blinks evoked by electrical (Fig. 3B) and air puff (Fig. 3D) stimuli, the averaged spike density function of these three burst neurons was the same for both stimuli (Fig. 3D, inset). Similarly, averaging the latency of the end of the blink relative to the cornea stimulus (Fig. 3A, ↑) as a function of the latency of the burst relative to the cornea stimulus (Fig. 3A, ↓, Start of Burst) (40 neurons; 2 ms bins with 10–37 blinks/bin) demonstrated that blink end and burst onset were independent (Fig. 3E, ●). Although the end of blink latency ranged from 13 to 120 ms over the entire data set (Fig. 3E, ○), the average end-of-blink latency was constant despite a twofold range of burst start times. We tested whether burst neuron discharge correlated with the intensity of cornea stimulation for six neurons. The peak firing frequency of the burst increased with cornea stimulus intensity from threshold to ∼2T, but remained constant for higher stimulus intensities (Fig. 3F, ▨). OOemg amplitude, however, increased over the entire range of stimulus intensities tested (Fig. 3F, ■). Thus, although blink-evoking trigeminal stimuli altered burst neuron activity, the discharge did not correlate with trigeminal reflex blinks and related only weakly to cornea stimulus intensity. Previous studies demonstrated that subjects increased the magnitude and duration of trigeminal reflex blinks to compensate for upper eyelid restraint (Evinger and Manning, 1988; Evinger et al., 1989; Pellegrini and Evinger, 1997; Schicatano et al., 2002). This cerebellum-dependent blink adaptation paradigm (Pellegrini and Evinger, 1997) provided a way to test whether IP neurons modified their discharge appropriately to account for the compensatory increases in blink amplitude and duration. For 15 of 26 of the anesthetized animals, eyelid restraint significantly increased ipsilateral blink duration and amplitude. Recordings from 11 pause and 4 burst neurons were made in the 15 animals whose blink amplitudes significantly increased with restraint. For the 11 pause neurons, 6 pause neurons exhibited a transient burst. 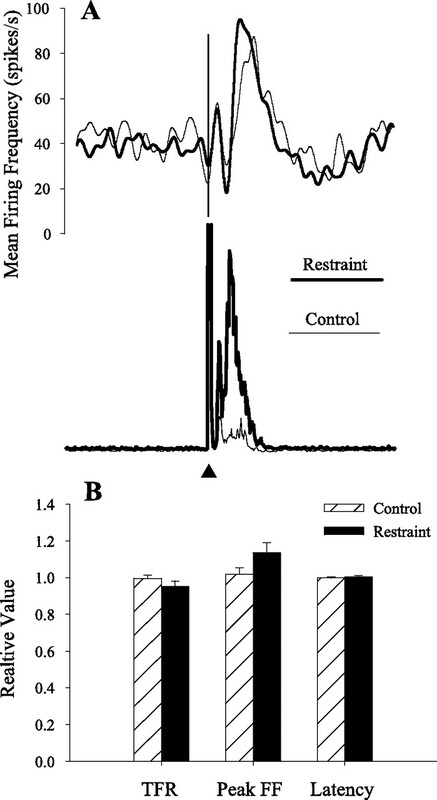 The discharge of both groups of pause neurons changed concurrently with eyelid restraint (Fig. 4). Blink duration and OOemg activity per millisecond during the blink significantly increased by 67% (F(2,266) = 15.3; p < 0.001) and 102% (F(2,266) = 16.0; p < 0.001), respectively. Concomitant with the increased blink duration, the last spike before the pause in neural activity occurred 26% (p < 0.001; n = 66) (Fig. 4A,C) and 59% (p < 0.001; n = 48) (Fig. 4B,D) later than control trials for pause neurons with and without a burst, respectively. The latency for the spike before the pause increased an average of 15.9 and 13.0 ms for the pause neurons with and without a burst, respectively. Consistent with this change, the average increase in blink duration was 14.7 ms. Restraint shortened pause duration by 49% for pause neurons with a burst (p < 0.001; n = 66) (Fig. 4A,C) and 11% for pause neurons without a burst (p > 0.05; n = 48) (Fig. 4B,D). Consistent with the increased blink amplitude, restraint significantly increased tonic firing rate by 14% for pause neurons with a burst (p < 0.001; n = 66) (Fig. 4A,C) and 7% for pause neurons without a burst (p < 0.05; n = 48) (Fig. 4B,D). Although restraint significantly increased blink duration by 46% (F(1,75) = 28.5; p < 0.001) (Fig. 5A) and the average OOemg amplitude per millisecond by 327% (F(1,75) = 70.5; p < 0.001) (Fig. 5A) with the four burst IP neuron recordings, neither the start of the burst (F(1,73) = 1.23; p > 0.05) (Fig. 5B), peak burst firing frequency (F(1,73) = 3.66; p > 0.05) (Fig. 5B), nor tonic firing frequency (F(1,73) = 1.67; p > 0.05) (Fig. 5B) changed significantly. Thus, only pause IP neurons altered their discharge appropriately to modulate adaptive modification of reflex blinks. Pause neuron activity with blink adaptation. A, The averaged spike density function of six pause neurons with burst and OOemg activity before (light line) and during (heavy line) eyelid restraint. B, The averaged spike density function of five pause neurons without a burst and OOemg activity before (light line) and during (heavy line) eyelid restraint. C, The tonic firing frequency (TFR), the latency of the cessation of neural activity (Latency), and duration of the cessation of tonic firing frequency (Duration) relative to the median control value before (▨) and during (■) eyelid restraint for six pause neurons with a burst. Error bars are ±SEM. D, The TFR, the latency of the cessation of neural activity (Latency), and the duration of the cessation of tonic firing frequency (Duration) relative to the median control value before (▨) and during (■) eyelid restraint for five pause neurons without a burst are shown. Error bars are ±SEM. *p < 0.05; ***p < 0.001. Burst neuron activity with blink adaptation. A, The averaged spike density function of four burst neurons and OOemg activity before (light line) and during (heavy line) eyelid restraint. B, The tonic firing frequency (TFR), the peak firing frequency (Peak FF), and the latency of the burst (Latency) relative to the median control value before (▨) and during (■) eyelid restraint for all burst neurons. Error bars are ±SEM. If the cessation of pause neuron activity contributes to ending the lid closing phase of blinking, then altering the timing of the pause should modify the end of blink OOemg activity. Assuming that the cessation of pause neuron activity resulted from Purkinje cell inputs, we blocked this inhibition by microinjecting gabazine, a reversible GABAA antagonist, at the site of pause neuron recordings in six experiments. To illustrate the population changes in pause activity, we averaged the rectified OOemg activity and spike density functions for three pause neurons, two with a burst and one without (Fig. 6A). Before gabazine, the average tonic activity of these pause neurons was 44.2 ± 9.2 spikes/s. The cessation of spiking began near the end of blink, 46.3 ± 11.5 ms after the cornea stimulus, and lasted an average of 57.9 ± 12.4 ms (Fig. 6A, light line). After microinjecting gabazine, the mean tonic firing frequency of these neurons increased to 86.0 ± 18.7 spikes/s, the pause duration decreased to 20.5 ± 7.5 ms, and the latency of the cessation of tonic activity relative to the cornea stimulus increased to 78.5 ± 17.6 ms (Fig. 6A, heavy line). Over all six pause neurons, gabazine significantly (1) increased the tonic firing rate by 34% (F(1,93) = 39.95; p < 0.001) (Fig. 6B), (2) decreased pause duration by 18% (F(1,93) = 5.9; p < 0.05) (Fig. 6B), and (3) delayed pause onset by 6% (F(1,93) = 20.48; p < 0.001) (Fig. 6B). 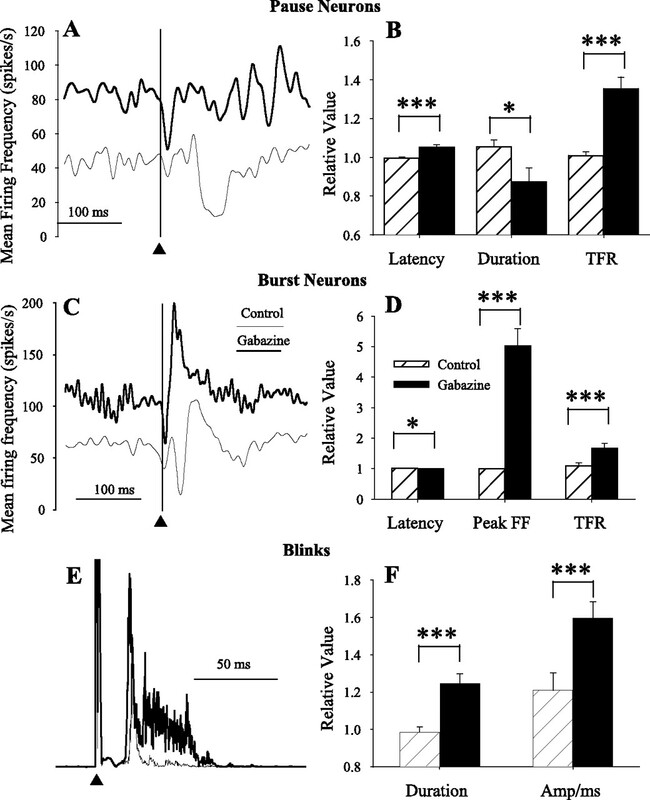 Consistent with a role for the cessation of pause neurons in terminating the down phase of blinks and the tonic activity facilitating OO motoneurons, gabazine injections at the site of pause neuron recordings significantly increased blink duration by 26% (F(1,138) = 25.4; p < 0.001) (Fig. 6E,F) and blink amplitude measured as OOemg activity per millisecond by 39% (F(1,138) = 7.84; p < 0.01) (Fig. 6E,F). 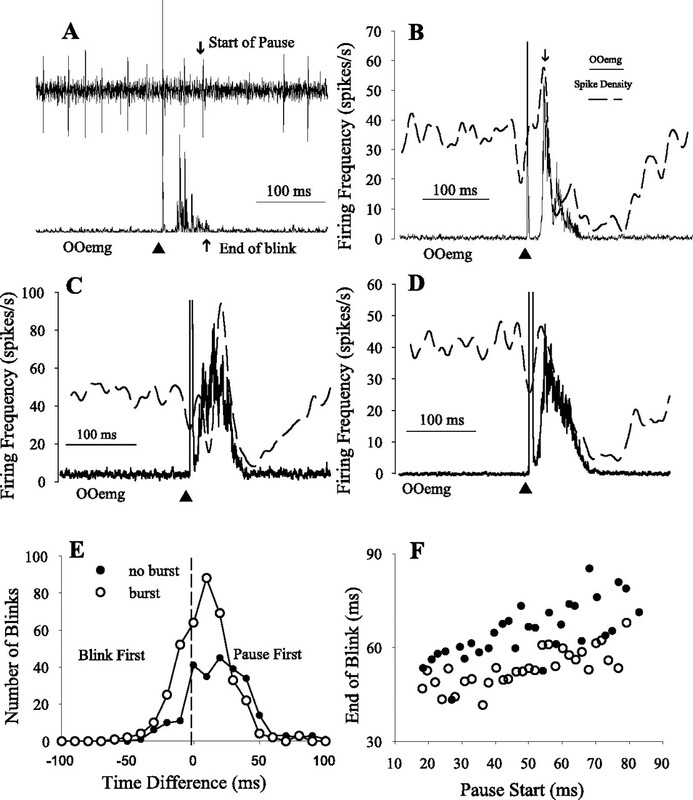 Consistent with a facilitatory effect of tonic IP discharge on OO motoneurons, a significant elevation of the baseline OOemg activity accompanied the elevated tonic firing frequency of IP neurons caused by gabazine (149% elevation; F(1,103) = 32.95; p < 0.001) (data not shown). Effects of gabazine on pause neurons, burst neurons, and blinking. A, The average spike density function of three pause neurons before (light line) and after (heavy line) microinjecting 100 μm gabazine at the site of unit recording in response to cornea stimulation (▴, vertical line). 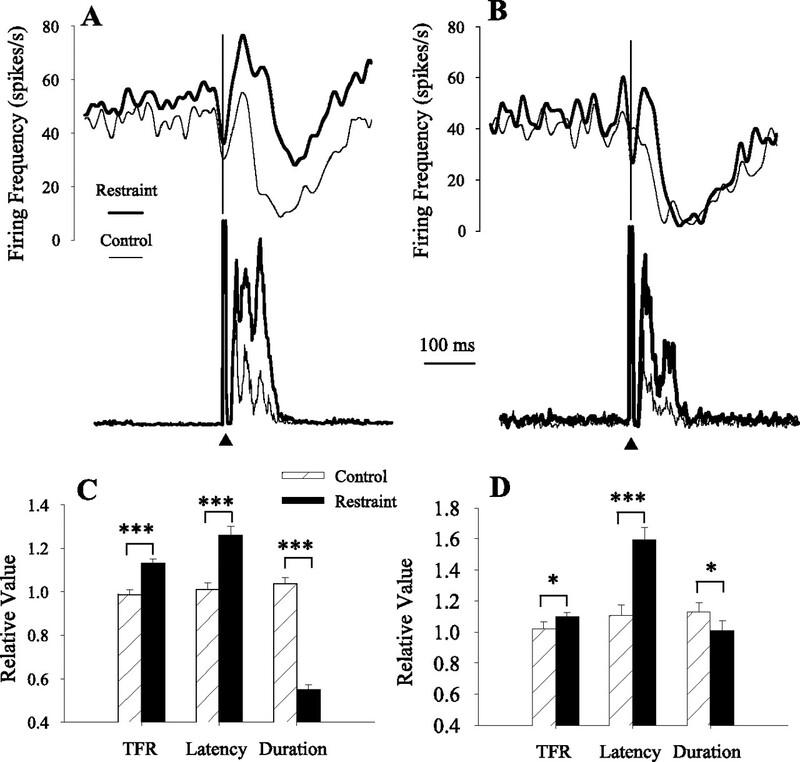 B, Latency of the cessation of neural activity (Latency), duration of the cessation of tonic firing frequency (Duration), and the tonic firing frequency (TFR) relative to the median control value before (▨) and after (■) gabazine injection for six pause neurons. C, The average spike density function of three burst neurons before (light line) and after (heavy line) microinjecting 100 μm gabazine at the site of unit recording in response to cornea stimulation (▴, vertical line). D, Latency of the burst of neural activity (Latency), peak firing frequency (PFF), and TFR relative to the median control value before (▨) and after (■) gabazine injection for three burst neurons. E, Average rectified OOemg of 10 trials before (light line) and after (heavy line) gabazine at the site of a pause neuron recording. F, Blink duration (Duration) and OOemg amplitude per millisecond (Amplitude) before (▨) and after six gabazine (■) microinjections made at the site of pause neuron recordings. Error bars are ±SEM. *p < 0.05; ***p < 0.001. Gabazine also altered the discharge of the three burst neurons tested. As with pause neurons, gabazine significantly increased the tonic firing rate by 58% (F(1,78) = 12.37; p < 0.001) (Fig. 6C,D). Gabazine also significantly elevated the peak firing frequency of the burst by 404% (F(1,78) = 49.82; p < 0.001) (Fig. 6B,C). Before gabazine, the tonic firing frequency of burst neurons exhibited a short pause in activity followed by a burst of activity (Fig. 6C, thin line). Gabazine caused a significant shift in the burst of activity toward the time when the pause normally occurred (F(1,78) = 4.57; p < 0.05) (Fig. 6C,D). This burst was either an enhancement of the normal burst that occurred at a shortened latency or a strong excitatory input revealed by blocking inhibitory inputs. Three lines of evidence demonstrate that IP pause neurons modulate the termination of trigeminal reflex blinks. First, the mean cessation of all pause neuron activity 6.0 ms before the OOemg is consistent with a role in ending blink down phase. This decreased activity reduces the excitatory drive to the facial motoneurons through the contralateral red nucleus (Fanardjian and Manvelyan, 1984; Morcuende et al., 2002). In the cat, IP pause neurons have an antidromic latency of 0.81–1.21 ms after red nucleus stimulation (Jimenez-Diaz et al., 2004). Combining an assumption of equal conduction velocities for the IP projection to the red nucleus and for the red nucleus projection to OO motoneurons with the 2 ms latency of OOemg activity after OO motoneuron discharge (Pellegrini et al., 1995), a pause neuron action potential should affect OOemg activity 5–6 ms later. Second, the timing of the cessation of activity of the pause neurons increases appropriately to account for changes in OOemg activity with blink adaptation (Fig. 4). In pause neuron recordings, eyelid restraint delays the cessation of pause neuron activity by 15.9 and 13.0 ms and increases blink duration by 14.7 ms. Third, the data from microinjecting gabazine at the site of pause neuron recordings also support a role for pause neurons in modulating the end of OOemg activity. GABAA blockade significantly delays the cessation of pause neuron discharge (Fig. 6A,B) and increases blink duration (Fig. 6E,F). If IP neurons facilitate OO motoneurons via the red nucleus, then increases in IP neuron tonic activity should increase blink amplitude. Consistent with this interpretation, increased pause neuron tonic discharge during lid restraint correlates with increased blink amplitude (Fig. 4). The increased tonic firing frequency of IP neurons after gabazine application also correlates with larger blinks. Similar to previous studies (Aksenov et al., 2004), increased IP tonic firing frequency correlated with elevated tonic OOemg activity (Fig. 6). Thus, pause neurons appear to modulate blink amplitude and participate in terminating OOemg activity. IP pause neuron modulation of reflex blinks employs the same mechanisms as fastigial neurons use to modulate saccadic eye movements (Fuchs et al., 1993; Kleine et al., 2003). Likewise, blink adaptation modifies IP pause neuron discharge in a way analogous to the change in fastigial neurons with saccade adaptation (Scudder, 2002; Inaba et al., 2003; Scudder and McGee, 2003). It is striking that deep cerebellar neurons modulate both trigeminal blink and saccadic eye movement duration using disfacilitation rather than facilitation. Unlike pause neurons, the latency of burst neuron elevated discharge remains constant despite changes in the duration of electrically evoked blinks (Fig. 3E) or air puff-evoked blinks (Fig. 3D). Nevertheless, there is a weak relationship between peak firing frequency and low cornea stimulus intensities (Fig. 3F). This relationship may occur because the initial pause in burst discharge (Fig. 3A,B) causes a rebound depolarization (Llinas and Muhlethaler, 1988). The Purkinje cell input from its climbing fiber input probably produces this pause in burst neuron activity, which gabazine eliminates (Fig. 6C). The pause preceding the burst has an average latency of 17.3 ± 5.51 ms (n = 40), similar to the 17.4 ± 2.2 ms complex spike latency of the blink-related Purkinje cells projecting to the IP burst neurons (Chen and Evinger, 2005). The absence of a burst of activity after the long Purkinje cell inhibition of pause neurons (Figs. 2, 5) may reflect differences in membrane properties between IP pause and burst neurons (Aizenman and Linden, 1999; Aizenman et al., 2003). This difference in membrane properties may reflect the position in IP. The pause neurons with a burst (Fig. 2A–C) are immediately caudal to the IP burst neurons. The types of blink-related IP neurons identified in the rat are similar to those characterized in other species. There are two types of cat IP neurons: one exhibiting a long pause in discharge after a burst, similar to our pause neuron with bursts, and another IP neuron increasing its activity near the onset of eyelid closure, similar to our burst neurons (Gruart et al., 1997; Delgado-Garcia and Gruart, 2002, 2005; Jimenez-Diaz et al., 2002, 2004). The anatomical distribution of neuronal types is also similar between species with bursting neurons occurring more rostral than pause neurons (Fig. 1). As also reported by other investigators using different species (Freeman and Nicholson, 2000; Aksenov et al., 2004, 2005), Delgado-Garcia and colleagues report that the activity of IP neurons exhibiting excitation with blinks also increase their activity with conditioned eyelid learning (Gruart et al., 1997; Delgado-Garcia and Gruart, 2002, 2005; Jimenez-Diaz et al., 2002, 2004). The absence of neural changes in burst neurons with blink adaptation (Fig. 5), but changes in activity with conditioned eyelid learning suggests that pause and burst IP neurons both act on OO motoneurons, but participate in different forms of cerebellar-dependent learning, motor adaptation, and associative motor learning. In motor adaptation, the nervous system compares feedback from the actual movement with the intended movement and adjusts the motor output to bring the two signals into register. The increased drive to OO motoneurons to compensate for eyelid restraint is a form of motor adaptation for which the cerebellum must be intact (Pellegrini and Evinger, 1997). Consistent with this cerebellar dependency, changes in pause neuron discharge can account for the changes in OO activity during blink adaptation. Likewise, changes in the discharge of fastigial neurons can account for modifications in saccade amplitude produced by saccade adaptation (Scudder, 2002; Inaba et al., 2003; Scudder and McGee, 2003), another form of motor adaptation. In contrast, burst neurons do not change their firing frequency with blink adaptation (Fig. 5). In associative motor learning, the nervous system learns that a stimulus predicts a subsequent stimulus. The eyelid movement that develops after repeated pairing of a tone coterminating with a blink-evoking stimulus, eyelid conditioning, is an example of associative learning. Like blink adaptation, eyelid conditioning is cerebellar dependent (Raymond et al., 1996; Pellegrini and Evinger, 1997; Hesslow and Yeo, 1998; Mauk et al., 2000; Attwell et al., 2002; Yeo, 2004; Thompson, 2005). Nevertheless, the cellular basis of eyelid conditioning is controversial (Koekkoek et al., 2003; Welsh et al., 2005). Although the current experiments did not examine burst neurons with eyelid conditioning, other investigators show that the activity of equivalent neurons in other species correlates with eyelid conditioning (Gruart et al., 1997; Freeman and Nicholson, 2000; Delgado-Garcia and Gruart, 2002, 2005; Jimenez-Diaz et al., 2002, 2004; Aksenov et al., 2004, 2005). Thus, the two types of IP neurons related to trigeminal reflex blinks may contribute differently in modulating normal blinking and participate in different forms of cerebellar learning. This work was supported by a grant from the National Eye Institute to C.E. (1999) Regulation of the rebound depolarization and spontaneous firing patterns of deep nuclear neurons in slices of rat cerebellum. J Neurophysiol 82:1697–1709. (2003) Morphological correlates of intrinsic electrical excitability in neurons of the deep cerebellar nuclei. J Neurophysiol 89:1738–1747. (2004) GABA neurotransmission in the cerebellar interposed nuclei: involvement in classically conditioned eyeblinks and neuronal activity. J Neurophysiol 91:719–727. (2005) Glutamate neurotransmission in the cerebellar interposed nuclei: involvement in classically conditioned eyeblinks and neuronal activity. J Neurophysiol 93:44–52. (2002) Cerebellar mechanisms in eyeblink conditioning. Ann NY Acad Sci 978:79–92. (1994) Effects of muscimol inactivation of the cerebellar interposed-dentate nuclear complex on the performance of the nictitating membrane response in the rabbit. Exp Brain Res 100:453–468. (2005) Cerebellar modulation of trigeminal blinks. Soc Neurosci Abstr 31:744–1. (2002) The role of interpositus nucleus in eyelid conditioned responses. Cerebellum 1:289–308. (2005) Firing activities of identified posterior interpositus nucleus neurons during associative learning in behaving cats. Brain Res Brain Res Rev 49:367–376. (1988) A model system for motor learning: adaptive gain control of the blink reflex. Exp Brain Res 70:527–538. (1989) Adaptive gain modification of the blink reflex. A model system for investigating the physiologic bases of motor learning. Ann NY Acad Sci 563:87–100. (1991) Eyelid movements. Mechanisms and normal data. Invest Ophthalmol Vis Sci 32:387–400. (1984) Peculiarities of cerebellar excitation of facial nucleus motoneurons. Neurosci Lett 49:265–270. (2000) Developmental changes in eye-blink conditioning and neuronal activity in the cerebellar interpositus nucleus. J Neurosci 20:813–819. (1993) Role of the caudal fastigial nucleus in saccade generation. I. Neuronal discharge pattern. J Neurophysiol 70:1723–1740. (2004) Amplitude changes of unconditioned eyeblink responses in patients with cerebellar lesions. Exp Brain Res 155:341–351. (1997) Involvement of cerebellar cortex and nuclei in the genesis and control of unconditioned and conditioned eyelid motor responses. Prog Brain Res 114:511–528. (1998) Cerebellum and learning: a complex problem. Science 280:1817–1819. (2003) Changes in cerebellar fastigial burst activity related to saccadic gain adaptation in the monkey. Neurosci Res 46:359–368. (2002) An experimental study of posterior interpositus involvement in the genesis and control of conditioned eyelid responses. Ann NY Acad Sci 978:106–118. (2004) Role of cerebellar interpositus nucleus in the genesis and control of reflex and conditioned eyelid responses. J Neurosci 24:9138–9145. (2003) Saccade-related neurons in the primate fastigial nucleus: what do they encode? J Neurophysiol 90:3137–3154. (2003) Cerebellar LTD and learning-dependent timing of conditioned eyelid responses. Science 301:1736–1739. (1988) Electrophysiology of guinea-pig cerebellar nuclear cells in the in vitro brain stem-cerebellar preparation. J Physiol (Lond) 404:241–258. (2000) Cerebellar function: coordination, learning or timing? Curr Biol 10:R522–R525. (2002) Neuronal premotor networks involved in eyelid responses: retrograde transneuronal tracing with rabies virus from the orbicularis oculi muscle in the rat. J Neurosci 22:8808–8818. (1997) Role of cerebellum in adaptive modification of reflex blinks. Learn Mem 4:77–87. (1995) The trigeminally evoked blink reflex. I. Neuronal circuits. Exp Brain Res 107:166–180. (1996) The cerebellum: a neuronal learning machine? Science 272:1126–1131. (2000) Organization of projections from the inferior olive to the cerebellar nuclei in the rat. J Comp Neurol 426:209–228. (2002) Lid restraint evokes two types of motor adaptation. J Neurosci 22:569–576. (2002) Role of the fastigial nucleus in controlling horizontal saccades during adaptation. Ann NY Acad Sci 978:63–78. (2003) Adaptive modification of saccade size produces correlated changes in the discharges of fastigial nucleus neurons. J Neurophysiol 90:1011–1026. (1998) in Walsh and Hoyt's clinical neuro-ophthalmology, Normal and abnormal eyelid function, eds Miller NR, Newman NJ (Williams and Wilkins, Baltimore), Ed 5, pp 1509–1594. (1991) Eyelid movements in facial paralysis. Arch Ophthalmol 109:1555–1561. (1992) Disruption of classical eyelid conditioning after cerebellar lesions: damage to a memory trace system or a simple performance deficit? J Neurosci 12:4403–4426. (1965) Precise localization of Renshaw cells with a new marking technique. Nature 206:211–213. (2005) In search of memory traces. Annu Rev Psychol 56:1–23. (1992) Changes in the motor pattern of learned and unlearned responses following cerebellar lesions: a kinematic analysis of the nictitating membrane reflex. Neuroscience 47:1–19. (1989) Cerebellar lesions and the nictitating membrane reflex: performance deficits of the conditioned and unconditioned response. J Neurosci 9:299–311. (2005) Normal motor learning during pharmacological prevention of Purkinje cell long-term depression. Proc Natl Acad Sci USA 102:17166–17171. (2001) Interpositus nucleus inactivation reduces unconditioned response amplitude after paired but not explicitly unpaired treatment in rabbit eyeblink conditioning. Neurosci Lett 308:181–184. (2004) Memory and the cerebellum. Curr Neurol Neurosci Rep 4:87–89. (1992) Cerebellar cortex and eyeblink conditioning: a reexamination. Exp Brain Res 88:623–638.